Need a face scrub for men? Then the Jack Black Face Buff Energizing Scrub is ideal for you. It deeply cleans your pores to remove the restrictions of shaving. As a result, you shave close to the roots and prevent the growth of ingrown hair. It contains small abrasives that remove dirt and dead skin for smoother skin. Regular use of this product enhances the appearance of skin and reveals radiant new skin. You can use this product 3-4 times weekly before you shave. This face scrub is a great product to use before you shave. As dead skin cells and dirt are removed from the pores of your face, nothing will be blocking your razor when you start to shave. In fact, the razor might get closer to the roots of the hair, creating less drag and burn. Best of all, it helps stop the growth of ingrown hairs by opening your pores. This exfoliating product smells fresh like mint. You can also feel the coolness of menthol on your face. This makes the product an instant solution to your tired skin in the morning. To be more precise, the smell closely resembles a fresh masculine cologne that is not overpowering. The small particles have a great abrasive quality that can remove the deepest dirt from your face. As you rub the particles into your face, you’ll instantly detect the dead skin cells being gradually removed. The power of the scrub lies in its ingredients, so you don’t need to rub that hard. After regular use, you’ll get the smooth skin that you’ve always desired. Unlike other face scrubs which come in very small packages, this face buff contains 177 ml of scrubbing goodness. Since you need to use this product 3-4 times a week, this might last for several months. Considering its price, this makes it great value for your money. For those concerned with the toxicity of microbeads to the environment, this face buff uses eco-friendly scrubbing beads that are 100% biodegradable. This means that these scrubbing beads will easily decompose, unlike aluminum oxide, which tends to pollute sewer systems and rivers. Some users noted that this face buff is too abrasive for their skin type. This might not be suitable for those with sensitive skin. To avoid having blotchy and red skin after each scrub, avoid rubbing too hard. If you know that you have sensitive skin, opt for gentler microbeads, like the Honeyskin Organics’ Organic Microdermabrasion Facial Scrub Exfoliator. A few users noted that this face buff caused acne. This might be an allergic reaction to some ingredients found in the product. It could also be a negative reaction to the coarse scrubbing particles. If you have acne-prone skin, you may prefer to other brands that have salicylic acid, like the Zenith Skincare’s Dermafresh Face Scrub. A small number of customers reported that the use of this face buff made their skin feel dry. This product might not be suitable for those with dry skin; if you have dry skin, then you may prefer to use something with great moisturizing ingredients, like the Candid Essentials’ Best Advanced Microdermabrasion Scrub. Jack Black Face Buff Energizing Scrub uses eco-friendly beads while Bee Friendly Skincare’s Organic Exfoliating Facial Sugar Scrub uses organic cane sugar. 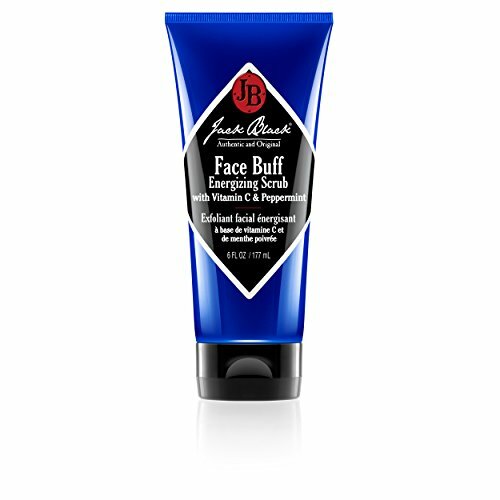 Although the Organic Exfoliating Facial Sugar Scrub moisturizes dry skin, Jack Black Face Buff makes shaving efficient. Though both products are free from artificial colors and parabens, Jack Black may be less organic than Bee Friendly. In comparison to the Dermafresh Face Scrub from Zenith Skincare, the Jack Black Face Buff Energizing Scrub is larger in size. While the Dermafresh product offers 60 ml of contents, Jack Black offers 177 ml of energizing scrub. Jack Black uses coarser beads than Dermafresh, making it harsher to sensitive skin. However, Jack Black offers an extra benefit of making shaving more efficient— something that Dermafresh doesn’t offer. Jack Black Face Buff Energizing Scrub might be suitable for those with normal skin, and men who want something good to use before shaving. It is effective in preventing ingrown hairs as pores are opened. Shaving becomes easy as it comes closer to the roots. However, this product might be too harsh for sensitive and dry skin.